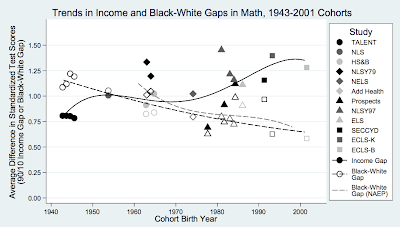 This recent paper (NYTimes coverage) notes that achievement gaps between 10th and 90th percentile income families are now larger than corresponding black-white gaps. Click for larger figures. The shaded shapes indicate 10-90 gaps, whereas unshaded figures indicate B-W gaps. The graphs with the actual data points on them aren't as persuasive as the nice stylized fitted curves in the NYT article. 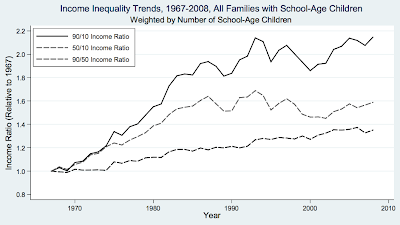 For instance, National Longitudinal Studies of Youth in 1979 and 1997, which would seem like the most apples to apples comparisons, don't show a rising correlation of parental income and achievement. . Then again, NLSY79 was already a mile above the curve, and NLSY97 merely reproduced the same size effect, with other studies catching up with it. Since "The Bell Curve" was based on NLSY79, this doesn't sound like a new trend to people who read The Bell Curve with care -- Herrnstein and Murray predicted it a long time ago. In summary, meta-analysis is hard. Scores on measures of scholastic achievement are more susceptible to cultural influences (family environment) than scores on IQ tests proper. This was seen in the Minnesota Transracial adoption study. I find this all very plausible - except that they seem to show too great a closing of the racial gap from what I've seen. 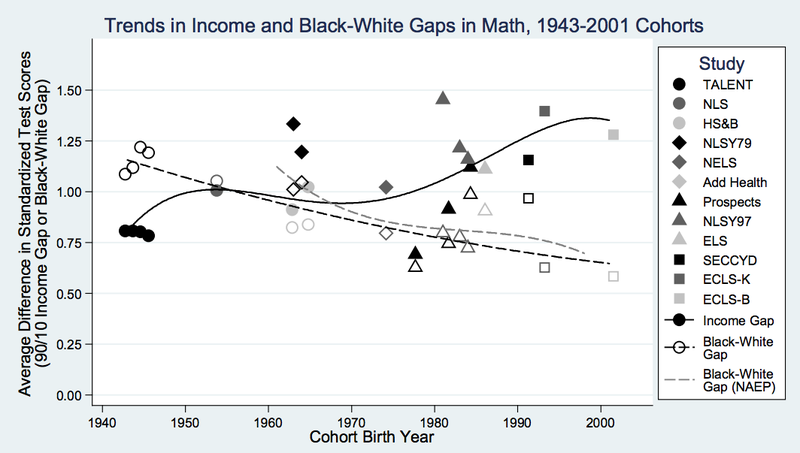 The second graph above, for example, implies a B/W racial gap of < .7. But that's not what I've found looking at NAEP results. The gap has been shrinking, but very modestly. Similarly, the SAT Math gaps continue to fall around 1 s.d. 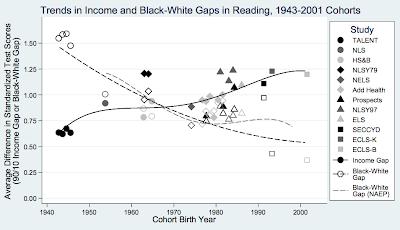 I would think that the big news from this article would be the dramatically shrinking racial gap - but I haven't seen any other evidence of this. The appendix doesn't help clarify things very much. 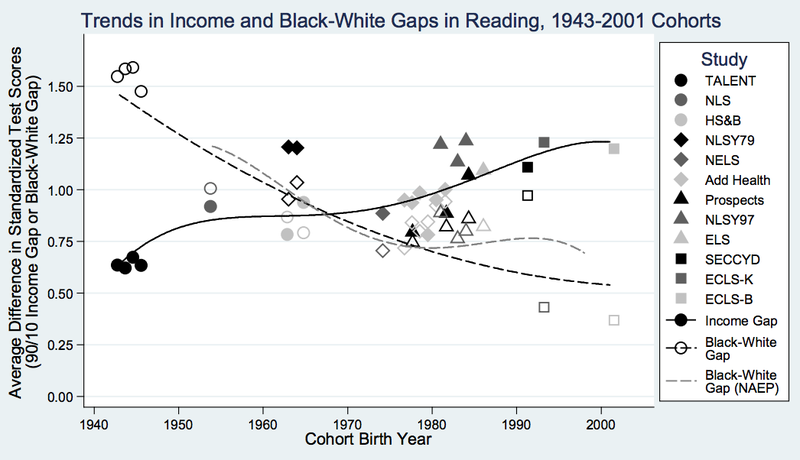 Anyone else find this surprising or have any insights on they're findings on the dramatically shrinking racial gap? It seems clear to me that many more white, upper class Americans are interested in elite higher ed, and are willing to do what it takes to prepare their kids for the admissions battle, than 20 or 30 years ago. "Amid concerns about the lagging math and science performance of American children, American adults are actually scoring higher than they did 20 years ago on a widely used index of civic scientific literacy, according to a University of Michigan researcher"
According to rushton and Jensen, the b/w gap in the U.S. has not decreased at all within the last 50 years. They even suspect that true b/w gap in the U.S. might actually be 1.5 SD instead of the 1 SD gap traditionally reported because the most disadvantaged blacks in the inner-city and rural south get excluded from the national norms. I don't think the US ever ranked high in terms of its per capita science graduation rates. Steve - this is achievement of the children based on parents' income, right? Have you posted anything up comparing achievement of children to achievement of parents with income as the third variable? 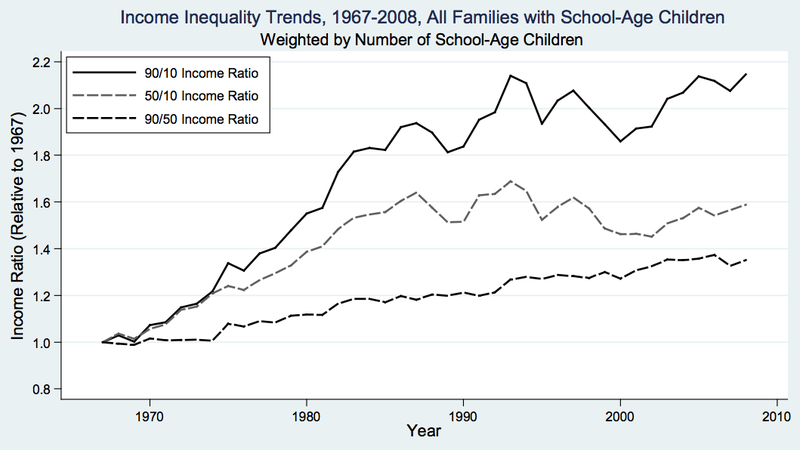 The question being, obviously, "is this just IQ aligning more with income over time?" " to a first approximation, there is a natural competitor pool that grew together with the Asian population"
"If the Flynn Effect is caused by environmental factors, it is most remarkable that a steady rise in the population's average test scores over a period of fifty or sixty years has had no effect on the mean IQ difference between blacks and whites, which has remained at about 1 SD since World War I. This era has been one of steadily diminishing disparities between blacks and whites in educational, social, and economic opportunities,. Yet the general upward secular trend in the overall population level of mental test scores has not changed the standardized difference between the mean test scores of blacks and whites." achievement for over 50 years. SOME of the gap is/was environmental. But not all, as we have seen.